Location! Location, Location! But That's Not All that make this Customized Oakmont, Truly One-of- a-Kind! There are also the Incredible Multiple Water & Long Lake Awe-inspiring Panoramic Views from the Extra Large, Cul de Sac Lot that overlooks the Pedestrian Walkways & Cobblestone Bridges! 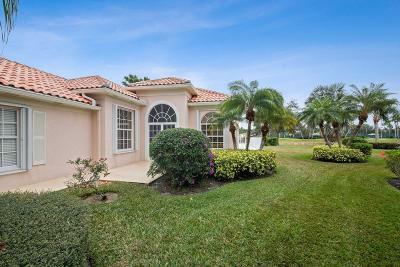 In RiverWalk, a 24 Hour Manned Gated Community that is 15-20 Minutes from Everything that makes Palm Beach County a Great Place to Live including the Ocean! The Screened Entry Leads to the Foyer with Breathtaking Gleaming Mahogany Hardwood Floors featured in Every Room of the House, and opening to the Great Room with a Soaring 12 Ft. Ceiling, a Full Wall Entertainment Center & the Dining Area with a Designer Lighting Fixture with Sliding Glass Doors to a Patio with a Retractable Awning! There are 18 Ft.